Printing from your iPhone, iPod touch, and now your iPad shouldn’t be difficult, but it is. Think about it: all three mobile devices have built-in Wi-Fi connectivity, meaning that from the start its designers saw the device being part of a network, whether it was a home wireless setup or one that you connect to while visiting a café. The iPhone and iPod touch also come with a set of built-in apps—Mail, Photos, Notes, and Safari—that would, on a desktop, feature a Print option as a matter of course. Yet these apps, considered so crucial to the iPhone OS experience that you cannot delete them, do not allow you to print. The simplest way to print from one of these mobile devices is not to print at all: it’s to do what most users probably do, which is to e-mail yourself the photo, link, or note in question and then wait until you get to a Mac or PC, retrieve the e-mail, and either access the URL or print the attached photo or the contents of the message. Though simple, this is not an especially easy or elegant solution. Its biggest merit is that it works consistently and reliably, and almost ensures you don’t lose vital information. PrinterShare from Dynamix is one of the many third-party options available for iPhone, iPod touch, and iPad users looking to print from their handheld device. Still, users have some hurdles to jump through before they can print from an iPhone or iPad. First, of coure, they have to buy and install a print app. 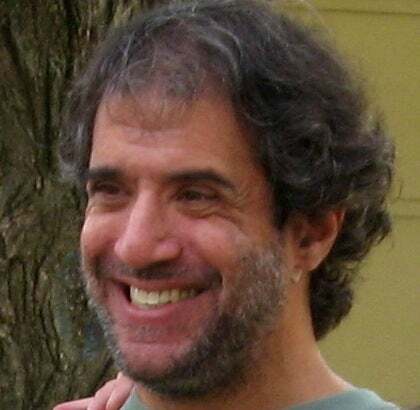 Then, there’s the matter of configuring it—rarely a simple process. There’s another issue, too. Given the limitations of the current iPhone OS—you can only run one app at a time—printing inevitably interrupts workflow. To print anything, you have to stop what you’re doing, open your printing app, provide or gather some kind of material, print it, then exit the app and resume what you had been doing. There’s no way around it—at least not until the iPhone 4.0 OS update arrives this summer and brings multitasking with it. Most iPhone printing apps work in a similar fashion: when you open them you have access to your stored photos, your contacts (usually), and a built-in Web browser. Many of the apps, including more than a half-dozen very good ones offered by EuroSmartz, require you to download, configure, and keep running a program on a Mac or PC that’s connected to a printer. Others, such as Dynamix Software’s PrinterShare, enable you to print to your business or home printer via a Web account. And some, like Microtech’s elegant ePrint and Wellala’s Print Magic enable you to print to any printer attached to your network, without the hassle of configuring intermediary software on a Mac or PC. 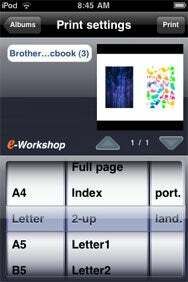 ePrint’s print preview screen provides many layout options for printing photo albums, as shown here, and also provides thumbnail and full-screen previews of each page. There is one major flaw that plagues all of these apps: none of them enable you to import your Safari bookmarks. This seems to be a limitation imposed by the iPhone’s software. Most allow you to save bookmarks, and some, such as ePrint, even save your browser history. But no matter what, if you want to print Web pages, you’ll be tapping in lots of URLs. A common, but not universal, problem with iPhone printing apps is that sometimes Web pages will not print in a readable fashion: depending on the app you choose, you usually have little or no control over how a printed Web page appears. There are exceptions. The better apps—ePrint, for example, and and EuroSmartz’s DocPrinter—format pages correctly for readable printing, enable you to select a default font size for printed Web pages, and may even provide print preview thumbnails. If you are interested in only printing photos, printer manufacturers Canon, Epson, and Hewlett-Packard offer free Wi-Fi apps that enable you to do so—but only with their respective printers. These apps have received only fair reviews from App Store users, in large part because of the photo- and printer-specific limitations. But you can also use these apps to print screenshots you have taken of notes and portions of Web pages—anything you can capture on your iPhone screen. (You take a screenshot on the iPhone by pushing the home screen button on the front bottom center of your iPhone and the on/off switch on the top right side simultaneously; the screen shots are stored in your Photos library). If you want to give printing from your iPhone a try, it’s probably best to try a free offering, such as ePrint Free or Printer Test for Print Magic, or an inexpensive app such as the $3 ePrint. There are limitations to the free offerings, but they give you a feel for how iPhone printing works. On the other hand, ePrint is a good full-featured printing app and one of the least expensive available. 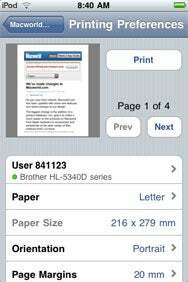 EuroSmartz’s iPad-optimized version of PrintCentral takes advantage of the Document Support feature in iPhone 3.2. Not much has changed on the printing front since the iPad arrived in early April. Apple’s latest mobile device has no built-in printing functionality, leaving users to turn to third-party apps for their printing needs. Pocket Watch, Microtech, Dynamix, and EuroSmartz have all produced optimized versions of their printing apps that run on the iPad as well as the iPhone and iPod touch. EuroSmartz has even come out with an iPad-optimized version of its PrintCentral app that takes advantage of the Document Support feature in the iPhone 3.2 OS. Document Support, which only works with the iPad at present, lets one app pass a file onto another app. In the case of PrintCentral, that means you can get a file via your iPad’s Mail client and immediately send it to the EuroSmartz app for printing or for storage and transfer. It’s not exactly multi-tasking, but it’s a way for third-party app makers to remove at least some of the hurdles that stand between users of Apple’s mobile devices and printed documents.